Locals and visitors alike never tire of exploring San Diego’s largest antique district picturesquely located in the seaside community of Ocean Beach. 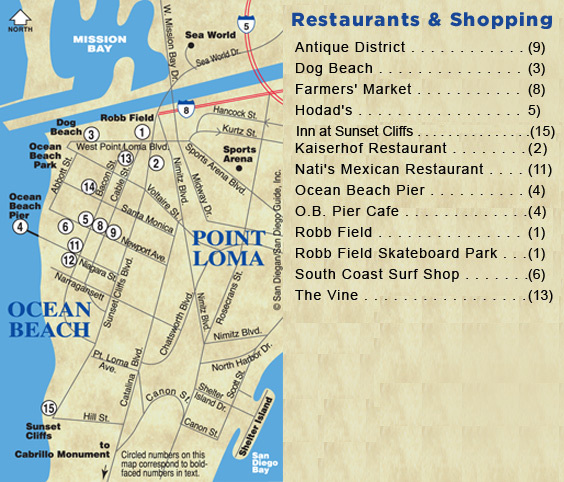 The Ocean Beach Antique District encompasses the 4800 and 4900 blocks of Newport Avenue at Sunset Cliffs Boulevard in Ocean Beach (619-222-8686). Most stores are open daily from 10 a.m. 6 p.m. and are ideally intermingled amongst cute little restaurants and micro breweries and even an authentic winery. So plan to make this a shopping spree and dining destination at this easy-to-get-to seaside community (see map at the bottom of this review). With more than more 200 antique dealers worthy of discovering, you can spend an entire day here browsing, shopping and dining. So, why not plan to make this a days visit as Ocean Beach has much to offer, including 75 recommended restaurants, several micro breweries and brew pubs as well as the longest fishing pier on the West Coast. Be sure to read the Ocean Beach chapter both online and in print in the SAN DIEGAN. 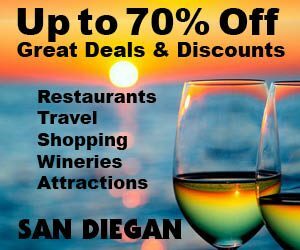 Since the SAN DIEGAN personally reviews and updates the content found here and in print annually, these antique stores featured below are personally recommended as being the best of the best. Thus, you should visit these store for sure. The grand daddy of them all is the 18,000-sq. ft. Newport Avenue Antique Center and Coffee House at 4864 Newport Ave. (619-222-8686) [naacsd@cox.net]. It’s open Mon.–Sat. 1- a.m.–6 p.m. and Sun. till 5 p.m. It’s home of over 80 dealers nestled together in what was once a 5 and 10 cent store, back in the 1950’s. So if vintage is what you are looking for, this is the place. And if you are craving a cup of gourmet coffee and a relaxing place to sit (find your way to the back of this store to their coffee shop). Yes, it”s all here! Here you will find an amazing collection of well-organized mini stores comprised of individual dealers showcasing a mixture of antiques and collectibles. But it’s not your traditional antique store. It is best described as one of the ten wonders of the world. Describing the contents of the Newport Avenue Antique Center and Coffee House is not easy as it is not your traditional stereo-type grandmother’s antique store, yet you’ll find some classic antiques from that era. The selection is much greater and all encompassing with lots of classic trends such as items from the 1700’s to mid century modern, shabby chic decor, retro (which is very popular these days), industrial, primitive, Asian antiquities, vintage and fine jewelry, fine paintings and fine prints, furniture, lighting, 50’s memorabilia, Indian artifacts and the list goes on and on. Here too is the largest collection of paper products in California with lots of classic magazine covers and literally thousands of old post cards to browse through. You can literally find yourself spending hours browsing through their collection. Countless customers have purchased wedding and engagements rings from their almost endless selection of jewelry. Also expect to find classics like vintage rocking chairs and home furnishings to beautify your home at the one and only Newport Avenue Antique Center and Coffee House. Also see the Ocean Beach Antique Association videos on this page. Across the street on Newport Avenue is The Corner Store at 4873 Newport Ave. (619-222-7911) [obcornerstore.com]. It’s open daily 10-:30 a.m.–5:30 p.m. Interestingly enough this store is in the middle of the block. In times past it was at the corner of the block but joined with another store but kept its original name. This darling store displays one of a kind antiques, gifts and home goods. But don’t expect to find the same goods that were popular in your grandmother’s era. Instead you’ll find an amazing collection of must have items including a wide array for furniture. This store is everyone’s favorite antique store offering an ever-changing merchandise for your home and garden. From a wide variety of vintage, cottage and shabby chic furniture and accessories to new adornments including new and collectible gifts, chandeliers, lamps, old doors and windows, jewelry, artwork, handcrafted soaps and greeting cards, mirrors, clocks, linens, and more. The Corner Store is equally well known for stocking Chalk Paint by Annie Sloan and her accessories. To keep pace with the popularity of this unique style of painting a back room painting workshop has been created. Thus, they offer beginner and intermediate workshops where you can learn how to use this incredible paint. Special group work shop classes can also be set up. Also see the Ocean Beach Antique Association page and video. Down Newport Avenue towards the ocean is The Ocean Beach Antique Mall/Empire Enterprises Antiques at 4926 Newport Ave. (619-223-6170) [antiquesinsandiego.com] [antiquesinsandiego@cox.net}. It’s open daily 10 a.m.–5:30 p.m. daily. The Ocean Beach Antique Mall/Empire Enterprises Antiques is the oldest and most respected Antique Mall for collectibles antiques in Ocean Beach. They offer over thirty years of experience in offering unique antiques and collectibles to the discriminating collector. 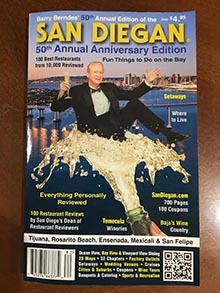 They have been the recipient of many Best of San Diego awards. So, without a doubt, this is one store not to miss when discovering the best of the best in Ocean Beach’s famous antique district. Featured items include vintage and estate gold, silver and costume jewelry, sterling flat and hollow-ware, clocks and watches, American artifacts, doll houses, art pottery, sports memorabilia, ivory and more. If you need a break from antiquing, stop in at Culture Brewing Co, at 4845 Newport Ave., a popular brewery that showcases local artists on their walls. it’s across the street from the . If you prefer to sample good wines then just across the parking lot from Newport Avenue Antique Center and Coffee House is the Gianni Buonomo Vintners Winery and Tasting Room (9) 4836 Newport Ave. (608-212-8551) [gbvintners.com]. The winery is open Wednesday through Sunday. With so much to offer, it’s no wonder that the Ocean Beach Antique District has become such an enjoyable place to shop, dine, drink wine or micro brews at local spots in the picturesque beach town of Ocean Beach. Adding to the charm of Ocean Beach is that cars are parked diagonally along its main shopping district giving Ocean Beach a nostalgic feeling. Come and enjoy a slice of San Diego at its best.